This statistic shows the unemployment rate in Greece from 2007 to 2017. In 2017, the unemployment rate in Greece was around 21.49 percent. Today, Greece reports the highest unemployment rate of all EU states. Greece is a developed country with a high-income economy, whose primary industry revolves around tourism and shipping. Agriculture also plays an important role for the country’s economy, more specifically for the EU. 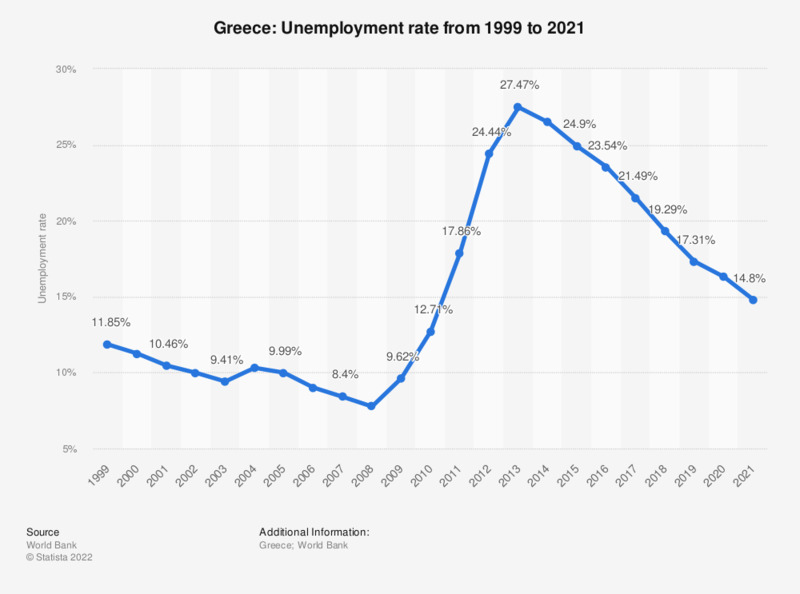 Greece had experienced large amounts of economic growth from the 1950s to the 1970s, however was economically devastated by the Great Recession in 2009 as well its own government debt crisis. Since the early 2000s, small increases in national debt were present within the Greek economy. These small increases turned into rather substantial surges between 2008 and 2011, which resulted in a large amount of accumulated public debt. However, financial assistance from several countries around the world as well as stimulus packages from the EU were issued to Greece, with the hopes of structural adjustments in the government and better decision making within the country in order to decrease national debt and increase productivity. The financial assistance helped stabilize Greece’s debt over the past several years, however many countries are arguing just how useful this support is, mostly because Greece has not made significant strides to improve its economy. As a result, consumers have become less optimistic about the possibility of a short term economic recovery in Greece. Additionally, investors have remained hesitant on investing into the country, generally due to an increasing debt-to-GDP ratio, which is ranked atop all countries in the European Union. The so-called debt-to-GDP ratio is an important indicator of a country’s ability to pay back its debts without incurring further debt.